Whenever I hear of a new pushchair company entering the UK market I am immediately interested. As a non-driver I find I get very excited over the only sets of wheels I can take for a spin. At the baby show I discovered Joovy – an American company who make double and triple pushchairs with a unique design. Many of their pushchairs have built in buggy boards, perfect for toddlers who can mostly walk, but need a secure place to stand on long journeys and when they get tired. Joovy have sent us an Ergo Caboose in preparation for the arrival of Mr Squish in the new year and we have been testing it out with only the one child as I get the feeling that navigating the world with a double will be very different to the singles I am used to. The Ergo Caboose has a front seat with two seat positions, and a small parent facing back seat which can be tucked in and leaves a large toddler step with handles which are inside the pushchair still and so not in the way at all when you are pushing. If you have a younger child, the pushchair comes complete with a car seat adaptor which fits most car seats and means you can have the little baby up high and parent facing whilst the older child looks out at the world. The pushchair has a huge hood giving lots of shelter for nap times and from the sun, and a back hood which can zip on or off depending on which set up you are using. The front seat has a choice of bumper bar or double drink holders. Dylan loves having something to hold on to so that he can peer out, and we also use bumper bars to attach books for when he needs a rest so we are saving the cup holders for now. The design is funky and I love the red colours of the seats. I found the pushchair really easy to put together and only used the instructions for a couple of bits. 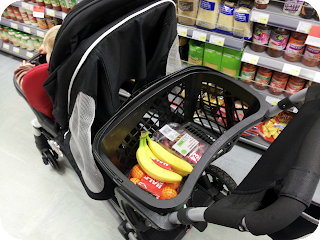 My first impression was that the Ergo was really easy to push around, and was as light and easy to manoeuvre as the travel system and strollers I am used to. I did find however, that going up kerbs was rather tough and I ended up leaning on the handlebars quite a bit to raise the front wheels. I think this is due to the entire weight load being at the front of the pushchair and am hoping it will even out once I have a car seat and squishy baby at the back to balance it. 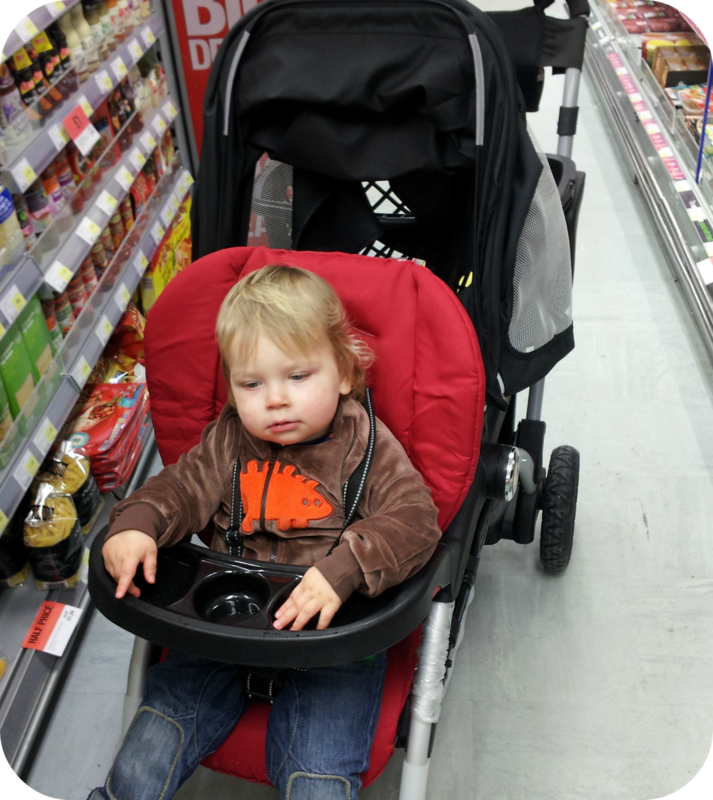 The first trip out with the Ergo and we popped to the shops to pick up a few bits. I found the pushchair perfect for this as I could easily balance a shopping basket on the back which is always something I struggle to do, and could actually pick up everything we needed! The basket is huge as well so held all the carrier bags on the journey home. I love that the pushchair is not as big and bulky as some other doubles, and I love that they have not compromised on basket size as with two babies you have twice as much to carry around! I really like the parent organiser on the handles as I have a tendency to lock myself out the house, I think this will be the perfect place to carry a spare key! The fact that the pushchair has several combinations means it will last a long time as once Squish is out of the car seat, Dylan will be old enough to use the toddler seat/ step at the back. I am not so keen on the lack of recline in the front seat as Dylan is used to lying flat for his naps. It doesn't seem to be bothering him however and he can sleep in the dark with the huge hood. I do think for a younger child though I would prefer the seat to go a bit further back. I like how easy the pushchair is but I do prefer the baby to lie flat so don't think I would be happy having him in a car seat all day long, and there is no option for a carry cot on this model. I definitely see us making use of this pushchair, but probably not as our sole pushchair as for long days out I would prefer for both of my children to be able to sleep flat. (A lot to ask from a double but I believe it is best for them). I am looking forward to giving it a proper test in February when the little one is here and will write a proper update about using it as a double pushchair then. The pushchair is sold without seat covers but it does have a mesh base underneath which is designed to spread the child's weight. The raincover is also sold seperately, You can check out the price of everything on the Joovy Website but as a guide, the basic pushchair is £366, not bad at all for a double pushchair that holds a car seat ,and £530 covers the pushchair and all accessories. Disclaimer: I was provided with an Ergo Caboose and accessories for the purpose of this review but all thoughts and opinions are my own. Very good stroller. Joovy sit and stand stroller is the best!